Heat coconut oil in a frying pan, add shallot and fry for 1-2 minutes, add chicken mince, cook for 3-4 minutes, stir in salsa or marinara sauce, chili flakes, garlic powder, salt and pepper. Cook on low for 10-12 minutes. Mix cheddar cheese and mozzarella in a bowl and divide this mixture into 4 parts. Fry each tortilla in a nonstick frying pan for 2-3 minutes or until cheeses melt. Remove to a plate and repeat with the remaining cheese. 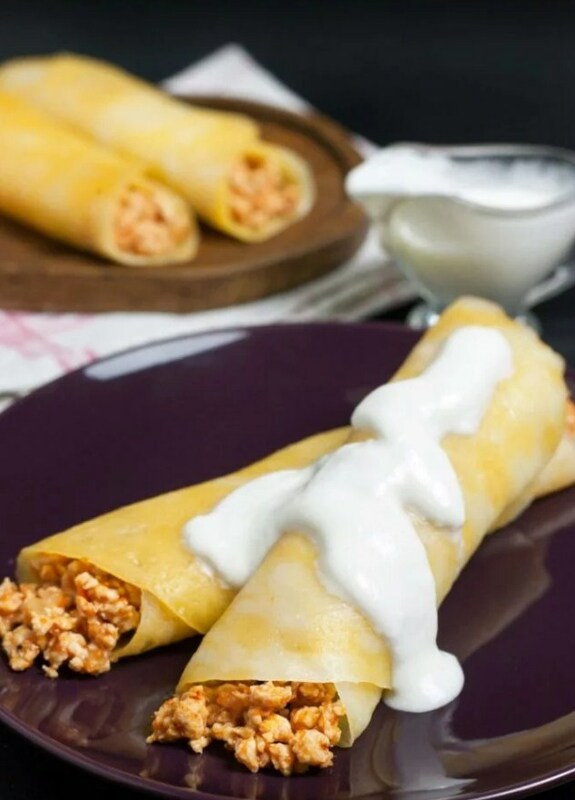 Let cool for a minute, then start wrapping the filling inside the cheese tortilla: add chicken mixture on each shell and roll quickly. Serve immediately, topped with sour cream (optional).